20 – Permission to Circulate, Sir! Colmenar has a village population of well under 3,000 (with another 800 or so in the campo but on Colmenar’s register). There are 12,695 cars registered in Colmenar. Is there a course I’ve missed? The one where you sit in one car with the window open, leaning out to simultaneously drive your second car, while checking your third and fourth cars in the mirror as you drive off? My favourite “possession” just at the moment is not my shiny new (old!) Seat Ibiza, but my “Permiso de Circulación” – permission to circulate! What a lovely concept. 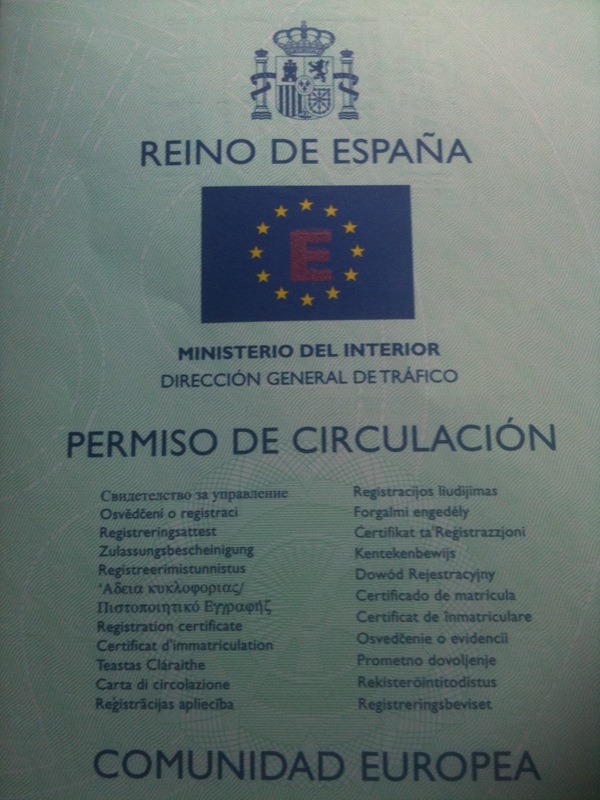 The Minister of the Interior has granted me, personally, permission to circulate throughout the Kingdom of Spain. I am thrilled with this, and plan to circulate a lot, waving my permission paper at anyone who asks (and many who don’t). It’s pretty much the equivalent of the road tax disc in the UK. Only in Spain it’s not paid centrally (there’s no equivalent to the DVLA, here). It’s paid locally within one’s municipality. Each municipality sets its own tax level (ie, the cost of the “Permiso de Circulación” ). And mine, Colmenar, happens to be particularly low. I have just paid for my first “Permiso de Circulación”, but it was in with various document transfers so I can’t be sure exactly how much was car tax and how much was admin and documents. But I’m reliably informed that elsewhere it costs significantly more. So the clever car-hire companies in Málaga rent (or borrow) an office address in Colmenar, and register all their cars here. The ayuntamiento (town hall) doesn’t mind, as they gain the tax revenue, but don’t have the hassle of the cars being parked here. Seems like a win-win situation to me. I’m just dying to know whose bakery or village house is going to get all those renewal notices sticking out of their letterbox!